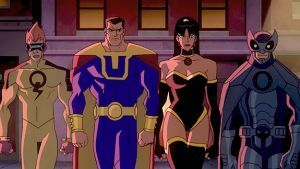 Tag "Justice League The New Frontier"
Justice League: Crisis on Two Earths was originally by writer Dwayne McDuffie conceived as an episode of the animated television series. A Lex Luthor (Chris Noth) from a parallel universe comes to “our” world seeking the help of the League –in this film, Superman, Batman, Wonder Woman, Green Lantern, Flash and J’onn J’onzz. In his world, the roles of heroes and villains are reversed. Luthor is the last surviving member of his world’s heroes. The Crime Syndicate has taken over, and he wants the help of “our” heroes. The story is tight, with plenty of action, fights and nods to parallel DC Universe characters. In the film, each Syndicate member is a crime lord, with his own group of “made men,” which is to say they’ve created their own super-powered underlings. Owlman (James Woods, who steals the show) is supported by evil versions of the Outsiders, and it was a pleasure to see obscure DC characters such as Halo and Looker in animated form. Owlman is truly a psychopath, and is one of the more interesting characters. Like the evil Spock of the “Mirror, Mirror” episode of the original Star Trek series, one might think his intellect would convince him that the path of corruption will ultimately lead to destruction, but Owlman obviously doesn’t care – not about his teammates, not about his lover, Super Woman, not even about himself. This plot thread elevates the character above most other super-villains we have seen. William Baldwin makes a suitable counterpart as Batman, and Mark Harmon as Superman as well. But this not a Superman-centric story. He is part of the team, without an excessive amount of screentime. Green Lantern, on the other hand, seems to be mainly background dressing. There is a sup-plot involving J’onn J’onzz which I personally could have lived without. I don’t feel it served the story as a whole, being mainly something to give the character more dialogue. The extras on the two-disc edition were disappointing. I expected more. 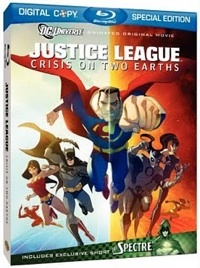 They included “A Better World,” a two-part episode of the Justice League animated series in which the Leagues journeys to a parallel world and meets alternate versions of themselves; "DCU: The New World," which applies the Crisis atmosphere of the DC Universe to a post-9/11 America; and "DC Showcase: The Spectre," an animated short featuring Gary Cole. Cole does very well as Jim Corrigan and The Spectre, the episode being somewhat of a 1940s film noir detective story, but with 1970s sensibilities, even down to the music. The footage features “distressed seasoning” common to old films, which is almost distracting, but not quite.